The Asus ROG Ryuo 240 first competes against the AMD Boxed cooler as usual. If you want, you can also join our recently released test of the Enermax LiqFusion 240 AIO water cooling, which was tested under the same conditions, and compare the results. Another special feature of the Asus ROG Ryuo 240 is that on Asus motherboards you could connect the fans to the cooler via the two 4-pin PWM sockets and connect the cooler with the 4-pin PWM connector to a 4-pin CPU cooler connector on the motherboard. You could then use the Asus own software “AI Suite 3”. However, since our test system is equipped with an ASRock motherboard, at least this way is denied. As the AMD Boxed cooler is not really a serious opponent for a 240 AIO watercooling, we also – as in the case of the Enermax LiqFusion 240 test – sent the Noctua NH-D15 into the race as opponent. 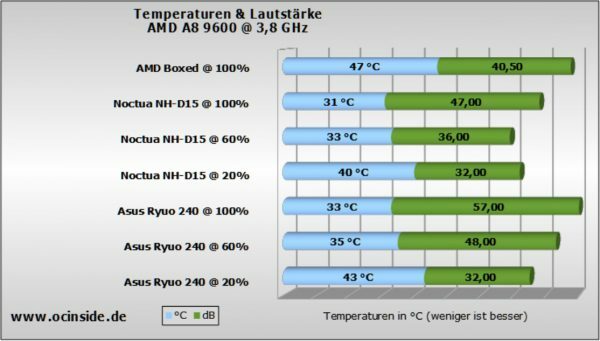 Of course, the Asus ROG Ryuo 240 water cooling beats the AMD Boxed cooler both in terms of temperature and noise level. The Noctua cooler, however, can play both its 140mm fan and makes the race overall. The Ryuo 240 comes close to the temperature values, but paid for this with a higher noise level. 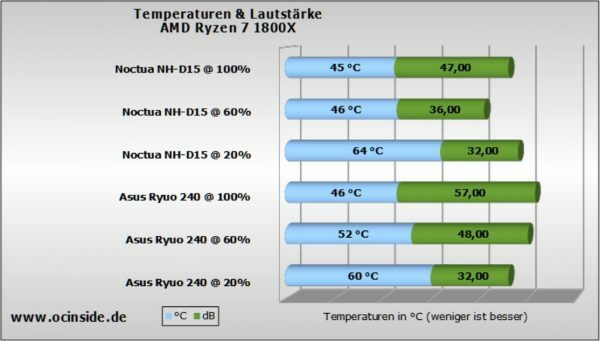 In addition, we also compared the Asus ROG Ryuo 240 and the Noctua NH-D15 on a AMD Ryzen 1800X. Here is the same picture, as on the AMD A8 APU: The temperatures of the Ryuo 240 are very good, but the NH-D15 is little better. The same applies to the volume of the fan. Since the pump can be perfectly controlled by PWM, we also tested how the pump speed affects the cooling performance and have the pump regulated separately at 100% fan speed. In addition, we tested 20% fan speed with 40% pump speed to find out if the previously measured 20% values may be due to too low a pump speed. The cooling capacity drops barely up to 60% pump speed barely. 20% should be avoided if possible. 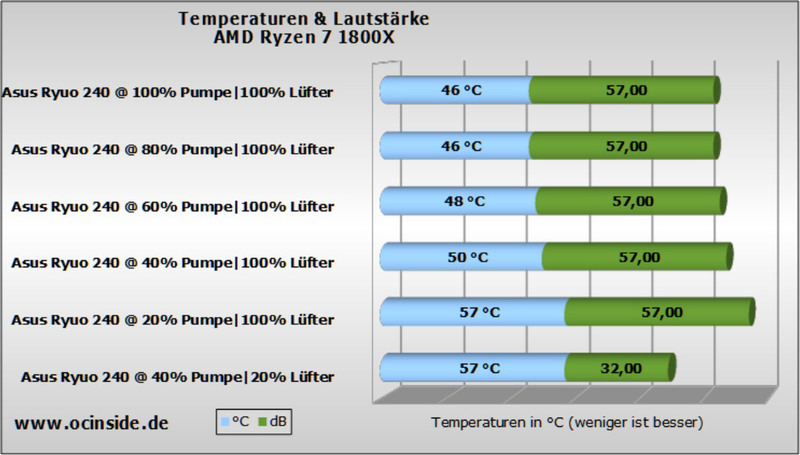 We also see nicely that in the lowest control range the pump speed costs more cooling power than the fan speed. The fan volume is measured with a dB meter from 100cm distance. In addition, we determine the respective rotational speed. In the case of the Asus ROG Ryuo 240 watercooling, however, the pump was also included, so that the values remain practical. The fans are unfortunately quite loud. Even at 40%, they already reach levels that are no longer silent. Here Asus pais for the lead in cooling performance over other 240mm AIO water cooling systems with the volume of the fans. The fan noise is, however, free of disorders. Our recommendation for tuning would be 20% fan speed coupled with 40% pump speed for low end, 40% fan speed coupled with 60% pump speed for mid-range and 60% fan speed paired with 80% pump speed for upper end. 80% and 100% fan speed with 80% pump speed you can still pick up due to the volume of the next OC record attempt. 100% pump speed brings no advantage. To be able to estimate the fans better, we have a video as usual, by letting the speed range run completely up and down again. It is not uncommon for AIO water coolers to encounter a slight pump hum or buzzing, which unfortunately we have also noticed in the Asus ROG Ryuo 240. However, since the pump can be regulated so well by PWM, you can also fine-tune this. Again, we have a short video. Overall, however, the whirring is so low that it quickly goes down in the fan noise as soon as you switch them on. 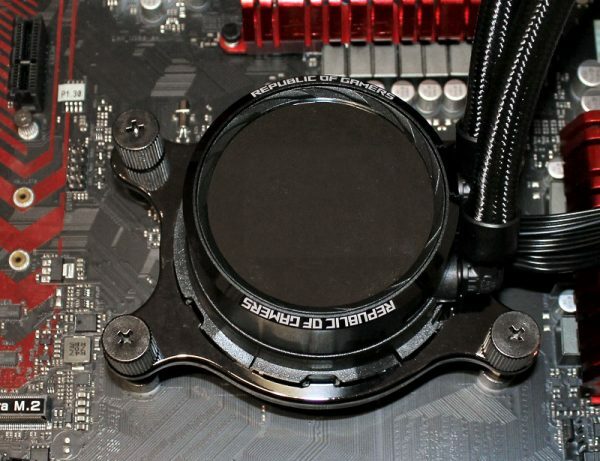 Let us now turn to the optical criteria of AIO water cooling.